These cookies start with a simple cookie made from a brownie mix (and cream cheese to make them soft and gooey). Then they are topped with a mound of peanut butter fluffiness and drenched in dark chocolate.The topping is similar to the traditional Buckeye Candy, but not quite as sweet and dense (again, thanks to the addition of cream cheese). I think cream cheese is probably the most versatile of ingredients. It is perfectly at home in just about any recipe! In a mixing bowl, combine peanut butter, 8 oz cream cheese, vanilla and powdered sugar. Beat with an electric mixer until smooth and fluffy. Set aside. In a large mixing bowl, use an electric mixer to beat together the brownie mixes, melted butter, 8 oz cream cheese and eggs. Use a medium cookie scoop, or tablespoon, to drop batter onto baking sheets. Bake for 12-15 minutes. 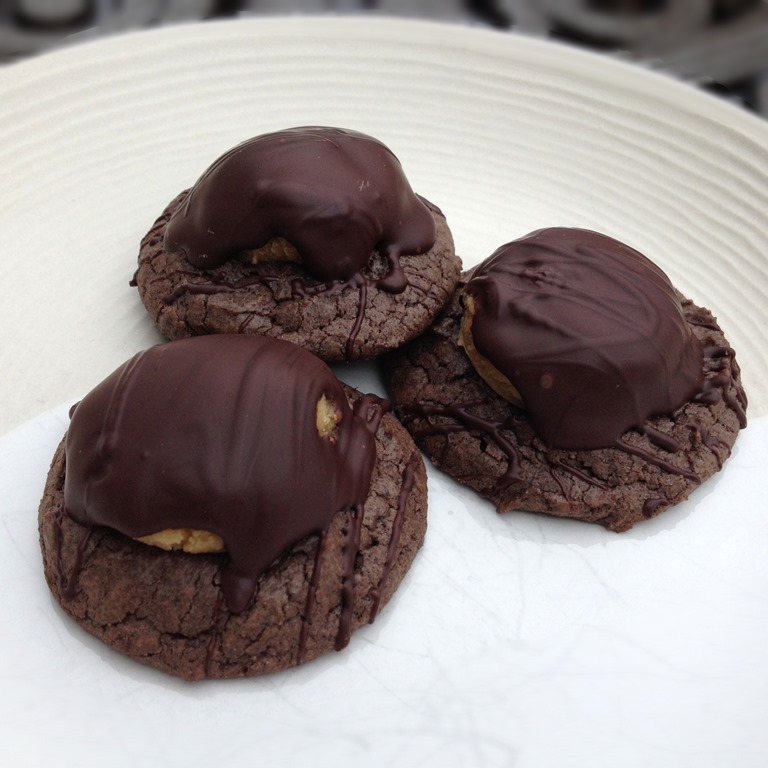 Use a small cookie scoop, or teaspoon, to spoon a ball of peanut butter topping onto each HOT cookie. Flatten topping just slightly with the palm of your hand. Allow cookies to cool for 5-7 minutes on the baking pan. Transfer to a wire rack and cool completely. Melt chocolate in a double boiler or in the microwave (in 30 second increments). Spoon melted chocolate over the top of each cookie. Allow chocolate to set before serving or storing. If cookies are not going to be eaten the same day, store them in the refrigerator.